JUNEAU, Alaska (AP) — A Canadian company that was courted as a potential partner in a proposed copper-and-gold mine near one of the world’s largest salmon fisheries in Alaska has backed away from the project. Northern Dynasty Minerals Ltd., which is seeking to develop the Pebble Mine project in southwest Alaska, said Friday that it was unable to finalize an agreement with First Quantum Minerals Ltd., the potential investor. It was not immediately clear what happened or what this means for the project, which has a permit application pending with the U.S. Army Corps of Engineers. Tom Collier is CEO of the Pebble Limited Partnership, which is owned by Northern Dynasty. In a statement, he said Friday was “business as usual” for him, and that developers are “continuing to press forward.” He said he believes Pebble will secure the funding necessary to continue the permitting process. A spokesman for First Quantum Minerals did not respond to a request for comment. The company posted on its website a release from Northern Dynasty that lacks specifics. 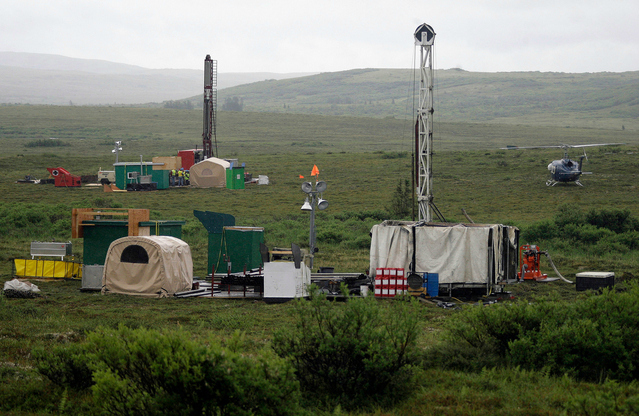 When the two companies announced talks in December, Philip Pascall, chairman and CEO of First Quantum Minerals, said in a release that the Pebble project is widely seen as “one of the outstanding unmined copper projects in the world.” He said his company was “very aware of the environmental and social sensitivity of this project.” Critics of the project, which is located in Alaska’s Bristol Bay region, hailed news of the fizzled deal. Bristol Bay produces about half of the world’s sockeye salmon. Joel Reynolds, Western director of the Natural Resources Defense Council, said in a statement that First Quantum Minerals did the right thing. “We hope First Quantum’s decision closes the door, once and for all, on this ill-conceived and uniquely reckless scheme,” Reynolds said. Northern Dynasty had been looking for a new partner since Anglo American PLC announced it was pulling out in 2013. Newer PostConnelly: Sen. Cantwell on study of giant Alaska mine -- Let us in! !